This month is graphic novels month, which I am very very excited for! Though I am not as much an aficionado of graphic novels as Yash, nor an online comics fan like Janet, but I do enjoy graphic novels whenever I get my hands on them. I love the mixture of text and image to convey an intricate story, I love the fast pace, I love the depth that can come out of a novel with so little words and I love that books and stories that blend pictures and words are, finally, being accepted as literature that can be enjoyed by anyone. It’s just so darn wonderful and fascinating! For many reasons my all-time favourite graphic novels is The Watchmen (1987) by Alan Moore. Moore changed the face of superheroes and reinvented what we now call the graphic novel – but to get down to that I’ll have to go into a little bit of history. Comics arose in the 1930s in an effort (by William Hearts and Joseph Pulitzer) to sell more newspapers. The comics were meant to entice the less literate people – that would be the illiterate poor and the non-English speaking immigrants. Then came the golden age for comics which spanned the 30s and 40s and began the superhero story with the debut of such famous superheroes as Superman (1938), Batman (1939) and Wonderwoman (1941) among many others. Comics, like any other mode, were a product of their time and the superhero stories were very much fuelled by the heroism and nationalism of World War II. However, grownups fighting crime in tights didn’t garner much respect in the literature sphere and this in combination with the original intention that comics reach the less literate, earned comics earned it’s reputation as a base type of literature meant only for immigrants, poor people and children (doesn’t that make you cringe?). This is s stereotype that, arguably, comics still fight with today. Perhaps because of this controversy the very definition of the term Comic is something difficult to pin-down and one of the many reasons for the rise of the “Graphic Novel”. Scott McCloud, an authority on Comics and graphic novels, attempted to settle the discussion by defining comics as “juxtaposed pictorial and other images in a deliberate sequence” (Understanding Comics 9). This definition is the reigning most accepted definition, though it remains unsatisfactorily broad. Which, I think, is where The Watchmen comes in as a cornerstone for the graphic novel format. Alan Moore with The Watchmen helped to distinguish graphic novels as simultaneously distinct from comics and literature that one could engage with critically. Moore plays, not only with the history of the comic book but with the format itself, including within the novel: essay text, comic book text and of course the graphic novel plot itself. 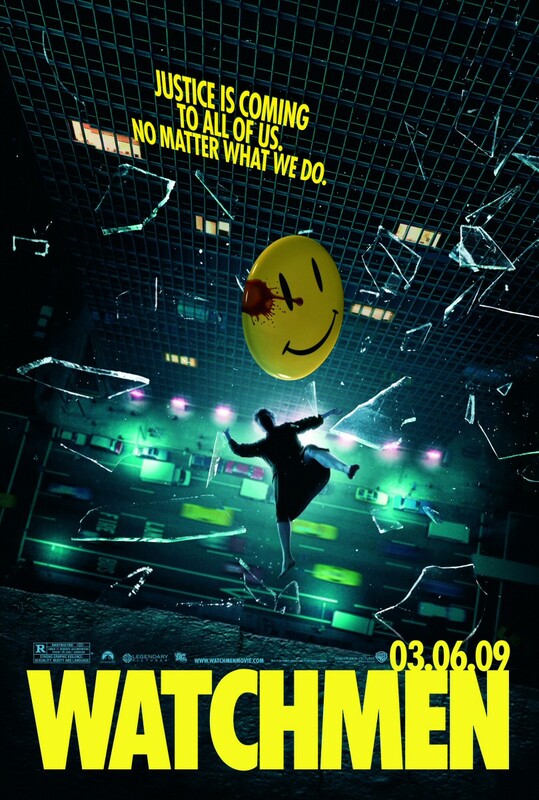 The Watchmen takes place in a very normal, if not slightly dystopian world. Superheroes don’t actually exist in the same capacity as they do in the Marvel Universe, for example, but rather are everyday people dressing up in costume to fight crime and injustice – which makes the fighting scenes all that much more bloody and brutal. 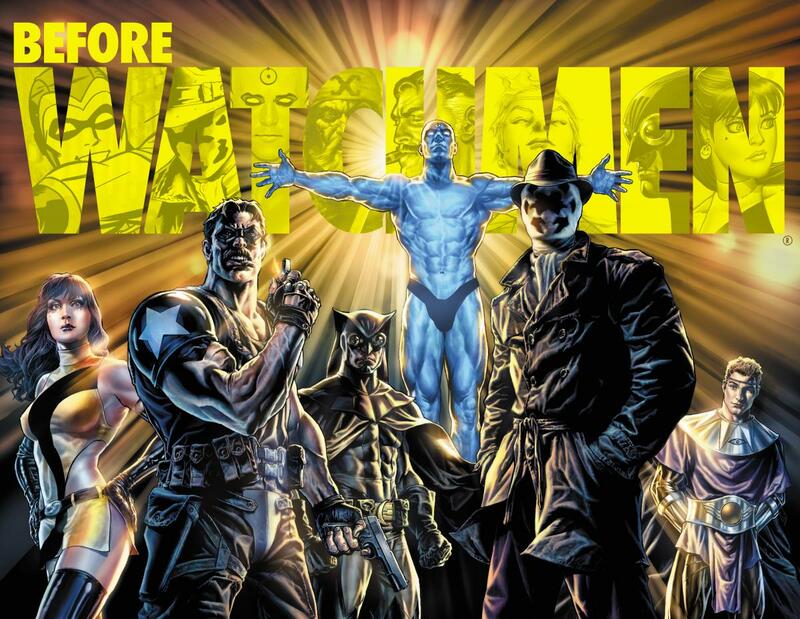 The exception to the rest of the Watchmen is Dr. Manhatten (the blue guy) who fell prey to a nuclear science accident which ended up giving him God-like abilities. The story shifts between timelines. The past depicts how the Superheroes began and used to be hailed as heroes in the time of the Vietnam war, and then their fall from grace when the public quickly turned against the heroes and they were disbanded by law. The present timeline shows how the descendent’s of these superheroes, who have had to abandon their superhero ways, are coping with real life. Even in this very brief outline echoes of the history of comics are apparent – the rise of the superhero. Here everyone longs to be ‘super’ it’s an escapism and a fantasy that is toyed with even today, however, The Watchmen doesn’t really present real superheroes which invites an instant disillusionment from that fantasy these are just normal people dressed in tights and fighting crime – that’s just… dangerous! Then the superheroes of old are seen as base and unwanted which leads to a law prohibiting them from acting as superheroes any longer (which mirrors the CCA). The story opens and follows a kind of whodunit plotline as the first pages depict the murder of an old Superhero, The Comedian, and then picks up with Rorschach as the broken down hard-boiled detective endeavouring to crack the case. The killing of the Comedian within the first few pages can be seen as a shedding of the term ‘Comic,’ not only is the Comedian character the most corrupt and vile character in the story it his his death that begins the unravelling of the graphic novel plotline and intertextual format. Immediately Rorschach begins to unearth all of the old superheroes in an attempt to uncover both the motive for the murder and murderer. In so doing Rorschach rekindles in the dormant heroes the desire to fight injustice and re-awaken their fellow heroes – this part of the text has character reflect on the inadequacies of the superhero genre and the superhero itself. Wherever there are superhero there are also supervillains and who is to stop a superhero from becoming a supervillain? Or from exacting personal vengeance as justice? Indeed, while being a hero can be valorous, who watches the Watchmen and stops them before they go to far? Something which has been pointed out often is how much The Watchmen is not for children – which I find interesting as the text features a child character reading through a comic series called The Tales of the Black Freighter. I have to admit upon first read through of The Watchman this portion of the story mystified me a little, and why have a child character eagerly read this horrific comic? The comic tells the story of a man that survives an attack from the Black Freighter, a ship manned eternally by doomed souls, and his frantic journey back home. He believes the ship will next attack his home-town harbour and so, in order to avert disaster, he plans to reach his home first. He crafts a raft out of the bodies of his dead compatriots (which is pretty gruesome) and embarks on a journey that brings him to the brink of madness (a character shift very similar to Rorschach’s). When he reaches his home, he believes it to have already fallen – but not so. In his attempt to exact revenge on his enemies he kills his own family in their sleep. He then sees the Black Freighter in the distance and realizes that he has become one of it’s damned souls (which mirrors both Dr. Manhatten and Ozymandius’s character genesis). What I think this plotline is meant to do is mirror the world of The Watchman and so reflect on how The Watchman mirrors our own world – which is rather bleak but also asserts the desire for true heroics and the simultaneous impossibility for their existence. Even with the best intentions, such as Rorschach, it is truly impossible to call him a ‘hero’ in the same way that is is clear that Superman is. However, I also think that The Black Freighter storyline is meant to point out that this kind of literature is not for an exclusive audience at all – and more importantly, that perhaps it is important that literature cannot me kept from anyone, all one need have is a desire to read stories.